GAO has over 20 years of experience delivering solutions to customers. GAO RFID is headquartered in Toronto, Canada but is incorporated in both Canada and the USA. Its customers range from SMEs to Fortune 500 companies to educational and government agencies. This experience enables its team of experienced CompTIA RFID+™ certified professionals to understand your requirements and deliver the correct RFID solution in order to maximize ROI and ensure expandability to support growth and new requirements. Because each business challenge has its unique set of requirements, GAO’s hardware spans the entire breadth of RFID technologies. Our RFID readers and tags extend from passive low frequency (LF), high frequency (HF) and ultra high frequency (UHF) to battery assisted semi-passive and active technologies. This ensures that the best hardware fit to solve your specific need can be offered. It also means you have choices to meet your current budget and flexibility to meet future requirements. For each of the frequencies, there are also further options. GAO carries fixed or stationary readers, desktop readers, handheld, and embedded reader modules. Also, depending on the environment we have multiple connectivity options including Bluetooth, WiFi, Ethernet (including Power over Ethernet [PoE]), various serial connections such as RS232, Wiegand, GSM, and more. Many readers have input output capabilities to control other devices using GPIO, and GAO also has smart readers which can run standalone applications. GAO’s carries the largest variety of RFID tags available: paper tags, on metal tags, rugged tags, glass and ear tags for livestock, tags for harsh environments, encrypted tags and so on. These are available in a wide array of form factors to meet almost any need. GAO also carries RFID antennae and other peripherals for your application. 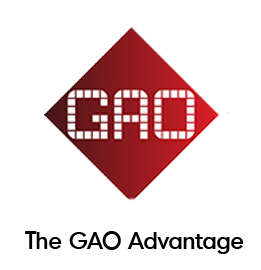 GAO has spent extensive development resources on its GAO RFID Middleware that serves as the core of our software solutions. This software actually extends beyond middleware to serve as a modular software engine allowing us to rapidly implement a system to meet your particular needs. It is designed to be flexible and modular allowing it to be built upon and easily interfaced to third party back end inventory/accounting packages if needed. It allows us to offer you both off the shelf solutions and to rapidly customize a solution to provide unique GUIs, cloud service capabilities, extensive reporting, back end connectivity and I/O control. Once again, you are provided with the correct and cost effective solution to meet your specific needs.